I’m glad you could make it by. So, something brought you here for a reason. Let me guess…you need help with something, right? Hey, we all could use help from time to time, and maybe you have a burning marketing question that you need help answering. Or maybe you want to double check your thinking on a project you’re working on. Boy, I sure wish I had a marketing, fairy godmother when I was starting out. PLUS! 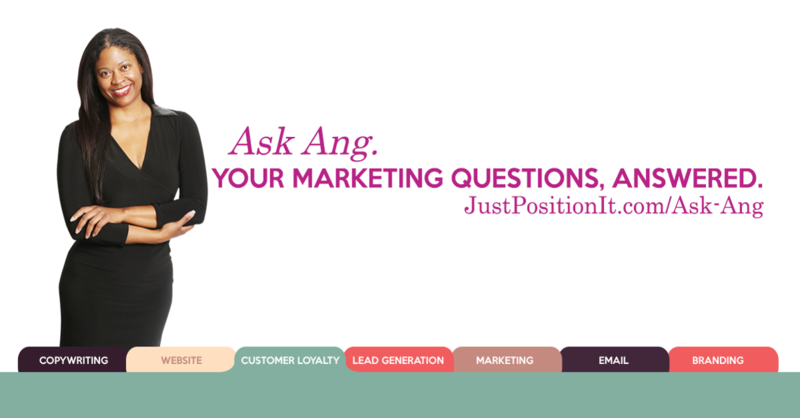 You’ll get a free gift just for submitting your question. If you want to learn more about who the heck I am, click here. Website Disclaimer: The advice and marketing strategies contained herein may not be suitable for your situation. The editor shall not be held liable for any loss of profit, revenue, or any commercial damages, including but not limited to special, incidental, consequential, or other damages. JustPositionIt!® does not guarantee that you will get any results or earn any money using any of our ideas, tools, strategies, or recommendations, and nothing on its websites is a promise or guarantee to you of future earnings. Copywriting and marketing results are not guaranteed. We offer no representations, warranties or guarantees verbally or in writing regarding your earnings, business profit, marketing performance, audience growth, or results of any kind. JustPositionIt!® Consulting does not provide legal advice. Please consult with your own or your company’s own marketing, legal, or compliance department(s) before using any materials, copy, suggestions, or marketing ideas provided. For full disclaimers, visit https://justpositionit.com/disclaimers/. The ideas outlined in this website are meant to help you think differently about yourself, your product, service, marketing, or brand. If you'd like a consultation for your particular purpose, please request one. © 2019 JustPositionIt!® All Rights Reserved.